The Patriot: SOI LEK SHOULD NOW PUT HIS WORTH WHERE HIS MOUTH IS! SOI LEK SHOULD NOW PUT HIS WORTH WHERE HIS MOUTH IS! Soi Lek Using Up First Of His Nine Lives At This Press Conference Witnessed By The Late Sulaiman Taha. 1. We begin by reciting Al-Fatiha for the soul of my comrade Datuk Sulaiman Taha, the State Assemblyman for the seat of Tenang who passed away recently. May he rest in peace and his family be granted the courage to manage their great loss by the Almighty. We also thank his family for their sacrifice and the great service that he rendered on behalf of Barisan Nasional. 3. Ethnic breakdown: Malays: 7,042; Chinese: 5,635; Indian: 1,754; Sabahans : 6; Sarawakians: 5; Orang Asli: 139; Others: 11 (as at 30th June 2010). UMNO: 20 branches with 4,768 members of whom only 4,072 are registered voters; MCA: 6 branches with 3,800 members of whom 1,700 are eligible voters; MIC: 11 branches with 1,450 members of whom 1,170 can vote; Gerakan: 4 branches with 432 members of whom 241 are voters and PPP: 7 branches with 975 members of whom only 690 can vote. 5. The total number of BN branches in Tenang are 48 with 11,428 members strong but only 7,873 are registered voters. 6. State seat of Tenang is under the Parliamentary constituency of Labis where Dr Chua Soi Lek comes from which his son YB Chua Tee Yong is serving replacing him. 7. 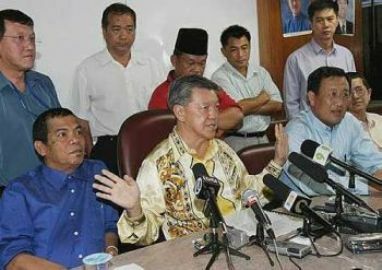 Over the past year Soi Lek has been very vocal questioning the position of the Malays and UMNO in the leadership hierarchy of this Nation forgetting the fact that the Malays were the ones who put his son into Parliament in Labis while the Chinese looked the other way. 8. Far before the Barisan Nasional Convention was held early this month at the MCA Headquarters, I had a premonition that Soi Lek would abuse Prime Minister Najib and UMNO’s graciousness by show-boating, taking jabs and potshots at the coalition’s Managing Partner UMNO, trying to act like his party was the saviour of Barisan Nasional when they weren’t even worth the shirt on their backs ever since 2008! 9. If BN’s Chairman Najib Razak started the Convention with a perfect upswing and most inspiring speech that just needed a basic follow-through by component members to complete the beautiful stroke, it was Chua Soi Lek from MCA who just had to break the momentum shanking the message that should have shown unity, cooperation and renewed vigour heading towards the general election that is already in clear sight! 10. As it is God’s Will, The Passing Of Sulaiman Taha Forcing A By-Election Of A State Seat In Labis Will Be An Acid Test For Soi Lek Because If He Can’t Even Bring Back The Chinese Numbers In His Own Back Yard Being The President Of The Largest Chinese Party In The Nation, He Would Yet Again Be A Disgrace To The Malaysian Chinese Association And Should Just Return To Being A General Practitioner In A Small Village Clinic Taking Blood Pressures And Pushing Panadols And Medical Chits. *Statistics were provided by Abib from UMNO Johor. YM Tengku, the article is an excellence political writeup for the MCA General. I could feel the concern and worried deep from your heart if Soi Lek failed to convince and pull the Chinese voters. Meanwhile I was told by somebody influential, that you always participated in almost all past by election. You are the true figther and the last bastion for Najib Razak! I'm sorry for the late reply. Yes this is a major concern but I think PM Najib has addressed it himself and we are seeing the Chinese approval coming back slowly but surely because of him while dismissing Chua altogether. Thank you for your vote of confidence. Looking forward to seeing you again here.